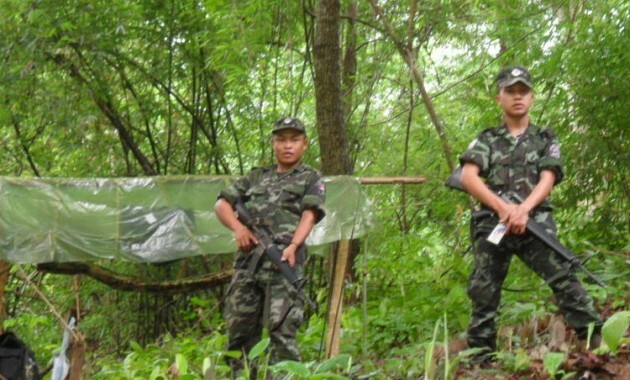 The Burma Army reneged on an agreement it had with the Karen National Union and arrested two Karen soldiers for collecting taxes at a temporary checkpoint. The two soldiers, from the Karen National Liberation Army Brigade 2, based in the Taungoo District were arrested while on checkpoint duty, by the Burma Army on October 1. Padoh Saw Eh Wah, the District chairperson for the KNU’s Taungoo District confirmed that Saw Aung Ko Latt and Saw Nay Moo from the KNLA Battalion 5, were arrested by a Burma Army Infantry Battalion 440 patrol led by Deputy Battalion Commander Ye Tun. Padoh Saw Eh Wah explained Karen News about the arrest of the KNLA soldiers. Padoh Saw Eh Wah said collecting taxes is based on KNU policy and it is intended to generate income for the organization. In August, Padoh Saw Eh Wah said that the KNU officials in the Taungoo area officially informed the relevant government authorities such as the Southern Military Command, Forestry Department and other administration departments about collecting taxes at checkpoints. Padoh Saw Eh Wah said that when the KNU officials and families of the arrested Karen soldiers went to No.3 police station, police officers told them that the two arrested soldiers had been sent to Taungoo prison. In the Taungoo area, one viss (1.6 kg) of cardamom seed is sold for 20,000 kyat, the KNU officials take 200 kyat per viss, as a production tax. Padoh Saw Eh Wah said that before tax is collected, KNU officials inform local traders and businessmen with official letter. Local villagers told Karen News that if the KNU set up permanent tax gates, it would not be convenient for traders or businessmen to go and pay taxes there. Local traders said they prefer to pay taxes at temporary gates as it is now arranged. In a related incident in Three Pagoda Pass Town in Karen State, an officer from the Democratic Karen Buddhist Army was arrested by government troops on August 26 and is still in jail. A local source said this is not an attempt by the Burma Army to stop tax gates but is more a selected and strategic attack on revenue generating efforts by ethnic armed groups.